Have you ever heard of CakeWrecks? People post pictures of cakes gone wrong, whether it’s a bad icing job, or a cake that never rose. (Personally, I prefer PinterestFail.) Today, however, I managed to a) bake a cake wreck and then b) rescue said cake. How? Ah, read on, dear reader! In the last few years, it seems like the cookie is everywhere, albeit under the name of Biscoff, and often in jarred spread form. I’ve never tasted it, but I know the spread has its own following and has inspired many a baker. It’s supposed to taste all deliciously spicy and buttery with caramel notes. Eh, I’ll stick with the cookie proper! But how does speculaas relate to my cakewreck? Well…I wanted to bake a cake for the DH to take into his work this week. I had the day off today (thank goodness, as I had an IBS attack yesterday at work and needed a day to recover) and decided today was the day. I made a sherry cake (this recipe) using some almond cream sherry that I had sitting around. I didn’t have a cake mix, as the recipe calls for, because I try to reduce my consumption of processed foods, so I made my own homemake cake mix instead (this recipe). The batter? Was odd. Too granular, for one, and just…not right. Oh, and did I mention that I was two eggs short? I didn’t have any ground flax seed to turn into a flax egg, so I just crossed my fingers and tossed it all into the pan. Oh, and I misread the instructions and mixed the streusel right into the batter. Needless to say, it did not turn out. It baked up beautifully in the bundt pan, and when I turned it out on the cooling rack, it was gorgeously golden and fragrant, but after it cooled, I sliced it…and had to use a bread knife to get through that now hardened caramelized crust. Only to find that the centre hadn’t set. Ugh! I tasted a crumb. It tasted exactly like speculaas! Ah, sweet serendipity! Because this apple crumble was next on my baking list. I scooped out the unrisen insides (I thought about keeping them for a speculaas-flavoured cake pop, but nixed that idea when I realized I had run out of freezer space), tossed the golden, crunchy cake rind in the blender, and blended up that baby! Apples and cranberries and cookies, oh my! Those crumbs? Turned out fantastic! I’ve now got two sandwich bags of speculaas-flavoured cake crumbs in my freezer, which I will use in the future to make a gingersnap-style cheesecake crust, and I used the rest of the crumbs in the apple crumble. The apple crumble is just apples tossed with some dried fruit/nuts (I left out the nuts) and sugar, and then topped with a mixture of butter and crumbled speculaas cookie. Or in my case, butter and crumbled cake rind. As I type this, my apple crumble in baking in the oven, filling the condo with a deliciously seasonal scent. Oh why is it not ready yet?!? 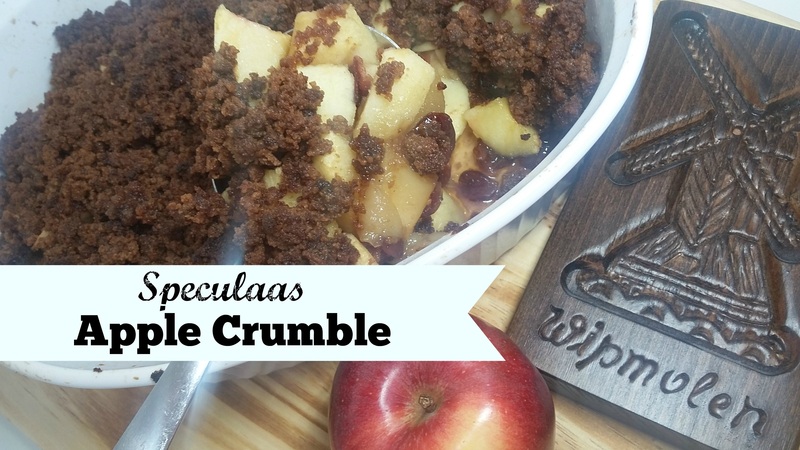 The verdict: As a replacement for actual speculaas cookies, my cake crumbles were perfect! As for the apple crumble…I prefer my own award-winning recipe. Dorie’s version is still delicious though — I plan to bring it into my work tomorrow. I expect it will disappear quite quickly! Next Post: Those lentil sprouts! They have sprouted, and are about to be eaten in an effort to balance out my cake crumb consumption. Stay tuned! This entry was posted in Cook-a-Longs R Us, Cookies, Desserts Not Otherwise Categorized on November 24, 2016 by Margaret. If you’ve ever read basically ANY post on this site, you’ll know by now that I have a sweet tooth. I do looooove my sweets! I also like being healthy, so obviously I’ve got to balance the two things out: sugar vs. health — it’s a knockdown, drag-out battle! Which…health will win, because I manage my sweet tooth with one thing. What is this magic thing that keeps my sweet tooth happy and my health at an even keel? Fruit. That’s it. That’s the key. The DH and I manage to eat at least 3 fruit bowls worth of fruit every week, no joke, and most of that is because of me. I wake up and eat fruit with my breakfast, often grab a piece of fruit when running out of the door to work, sometimes pack some fruit in my lunch on top of salads and definitely pack a homemade fruit salad in the DH’s lunch, come home after work and eat some fruit before dinner, and then eat looooots of fruit in the evening as snacks. High in fibre (which is important for me with my IBS), low(-ish) in calories, and full of taste and sweet, sweet sugar! Ah, fruit! How I do love thee! Despite the strong relationship that I have with fruit, I still have a love affair with baked goods. How to marry the two? 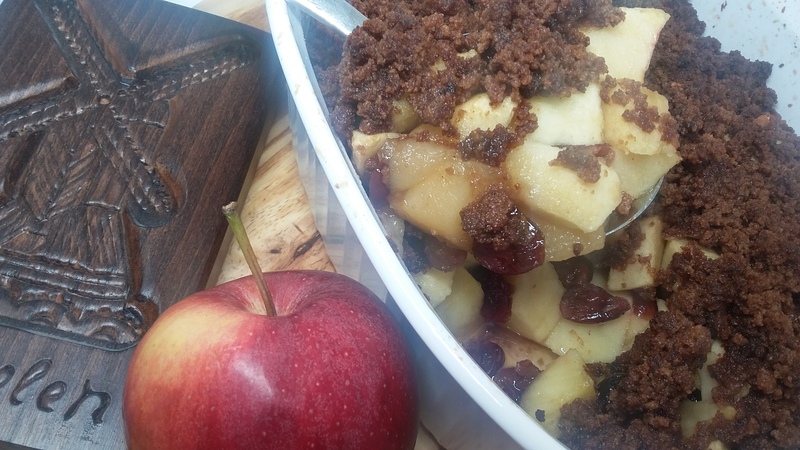 In recipes like my deeeelicious Harvest Apple Crumble (award-winning, yo’!) 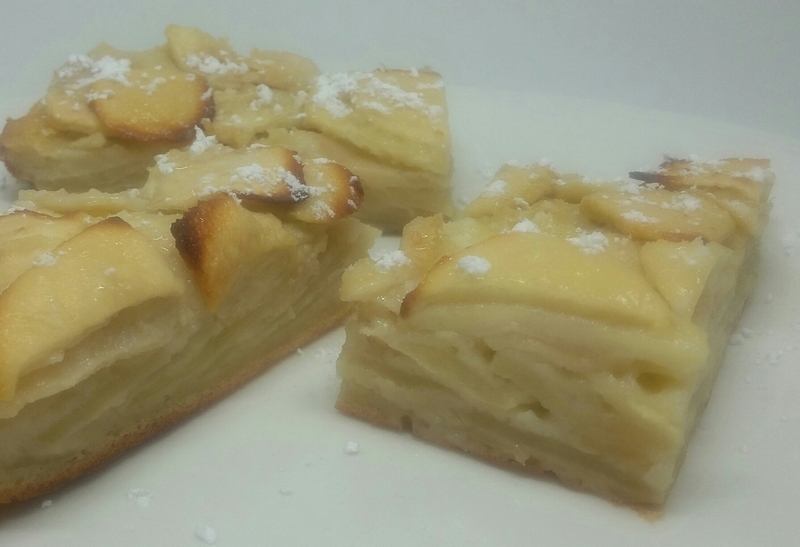 or in this week’s bake-a-long recipe, Custardy Apple Squares. It’s autumn, and my bake-a-long group is baking an apple recipe from Dorie Greenspan’s Baking Chez Moi cookbook. Basically, it’s apple slices covered in a leeeetle bit of batter (similar to crepe batter), and baked until puffy and golden. It goes into the pan all lumpy and bumpy and comes out of the pan all layered and golden. 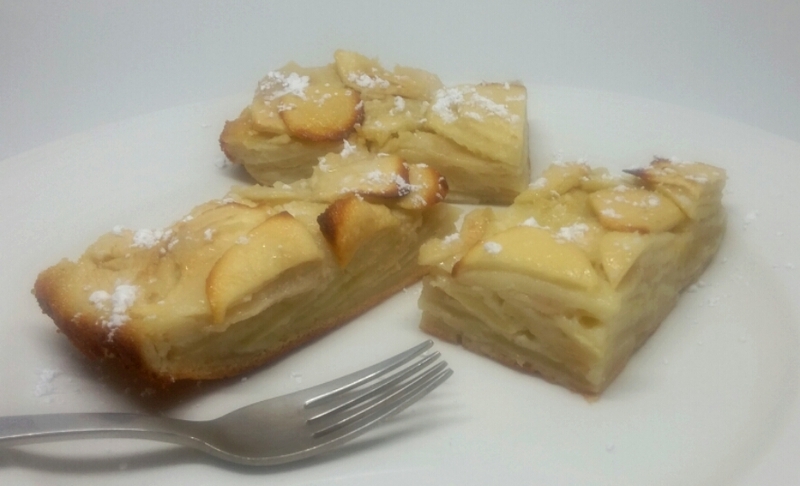 Let it cool, slice it up, sprinkle with icing sugar, and eat with abandon! It’s surprisingly healthy, and yet surprisingly tasty — mostly due to fruit, sweet fruit! So, there you have it. Got a sweet tooth? Satisfy it with fruit. Or baked goods containing fruit. Or…chocolate-covered fruit? Oh, yes, I think that would win! Next Post: Homemade yoghurt, oh yeah!!! Way super-duper easier than you think. Like, seriously. This entry was posted in Breakfast Foods, Cook-a-Longs R Us, Desserts Not Otherwise Categorized, Snacks on October 20, 2016 by Margaret. This week, my bake-a-long group is making Edouard’s Chocolate Chip Cookies, aka French-style chocolate chip cookies, from Dorie Greenspan’s Baking Chez Moi cookbook. 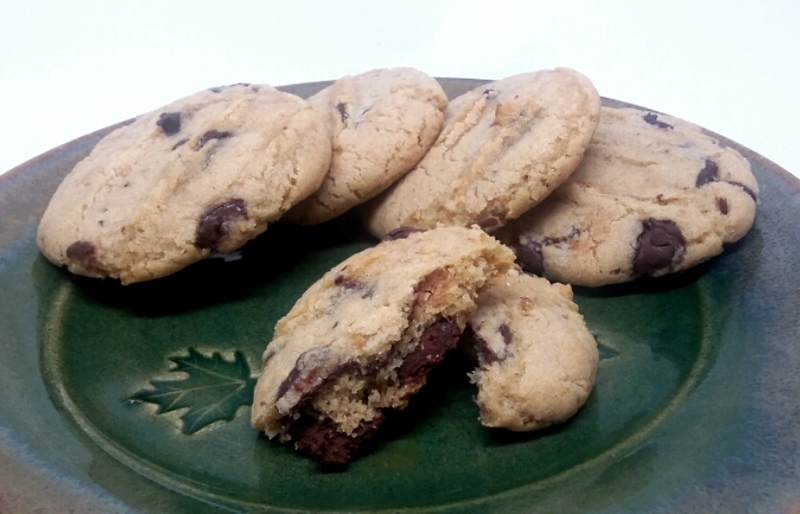 What are French-style chocolate chip cookies, you ask? Apparently, ones where some of the flour is subbed out for hazelnut or almond flour. But…I used up the last of my almond flour weeks ago, and I’ve never, ever come across hazelnut flour at my local bulk store, so…what’s a gal to do? Substitute, you say? You betcha! With what? Huh. Good question. More flour? I still followed the rest of Dorie’s instructions. Except for the part where she says to let the dough chill in the fridge. Um, no? I need cookies ASAP, people! Forget that! I did, however, follow her instructions for baking. I baked for 8 minutes, and then used a spatula to SQUISH them flat! Oh joy! (Technically, Dorie says to flatten with spatula. I interpreted this as ‘squish with intent’.) I have a colleague who loves to shred things; she just finds it so satisfying. That’s how I feel about squishing things — it just satisfies my inner toddler! The cookies turned out rather nice! The squishing definitely added something to them, as otherwise the high flour content meant that they wouldn’t flatten. I’m sure if one follows the recipe, they’ll flatten much more easily, probably due in part to the higher fat content. I’ll probably try to make these cookies again, this time with the nut flour. I think it would add such a lovely nutty note to the standard chocolate chip cookies. Want to see how others make them? Check it out here! Next Post: Sprouting green things? Low sugar yoghurt? Or…sugary, buttery, bites of goodness? Stay tuned! Linking Up at Southern Plate for Meal Plan Mondays! This entry was posted in Cook-a-Longs R Us, Cookies on September 13, 2016 by Margaret. Just get in my mouth already! 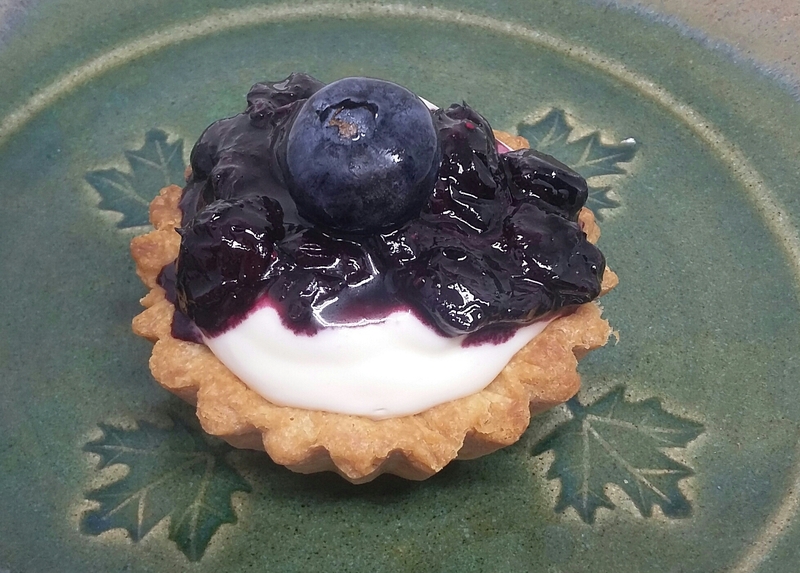 This luscious looking dessert is the Blueberry Corn Cheesecake that my bake-a-long group is baking this week from Dorie Greenspan’s Baking Chez Moi cookbook. As you can see, I left out the corn because I didn’t have it. Also, I couldn’t get my mind around adding corn to a blueberry cheesecake. Basically, it’s a shortbread crust (yum! ), filled with a cheesecake mixture. The recipe calls for mixing in some whipped cream, and it does make the filling much lighter than your average cheesecake. The topping is a combination of blueberries and corn, simmered with rosemary and citrus zest. I just boiled up some blueberries, sugar, and water, and then…stepped away from the stove for a minute, at which point the mixture burnt so thoroughly that it took me days to scrub the pot clean. (We shall never talk of this again.) So I topped the cheesecake with some homemade blueberry jam and called it good. Was it good? Well, it disappeared in 24 hours. (I mean I had to taste it, then another slice for dessert, then a midnight snack, packed some for my lunch and for the DH’s lunch, ate some for breakfast, ate some for a pre-dinner snack, and….gone. Much to the DH’s dismay when he came home for dinner and saw the empty tart pan. Hey, to the baker goes the spoils!) That said, I don’t think I’ll make it again. I found the filling a tad sweet, and I actually prefer a more solid cheesecake as opposed to the fluffy filling that this one had. 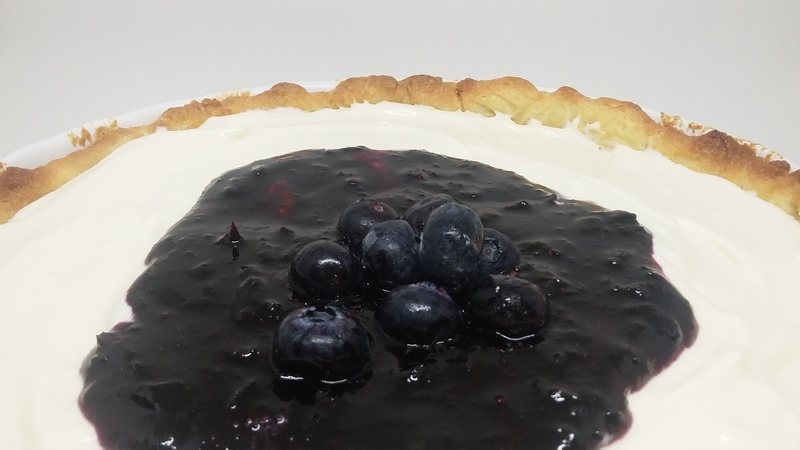 Still…blueberry cheesecake! Any way you slice it, that’s a win! Next Post: Homemade Yoghurt? Sprouted lentils? Or Mini Skor Cupcakes? It’s all about the balance! This entry was posted in Cook-a-Longs R Us on August 30, 2016 by Margaret. Slightly melty but oh so yummy! If you look closely at the photo, you’ll realize that I tasted the ice cream pops before I took the photo. Hey, quality control, right? It’s been swelteringly hot here in Toronto this past week, with the humidex hovering in the low 40’s. This is just not my jam. I go from air-conditioned home to air-conditioned work and back again, and still it’s too hot for me. Which is why when I realized that my bake-a-long group was making “Equimaux Pops” this week (from Dorie Greenspan’s Baking Chez Moi cookbook), I was ALLLLLL over that! I researched popsicle molds online and found some gorgeous ones, but in the end I settled for expediency and just bought one from the dollar store. I do not recommend this, as after this recipe, the mold is going straight into my garage sale/donation pile. Sometimes it’s worth it to invest in a nice piece of equipment. But I couldn’t justify the expense to myself for just one recipe, so a plastic dollar store mold had to suffice! These popsicles are basically ice cream on a stick, but a grown-up version, tasting like alcohol and studded with chunks of chocolate. I was tempted to do as Dorie suggests and dunk them in a coating of hard crack chocolate (i.e. “magic shell”), as it would have made it so much yummier, but really, do you think I had the patience for that? Ha! 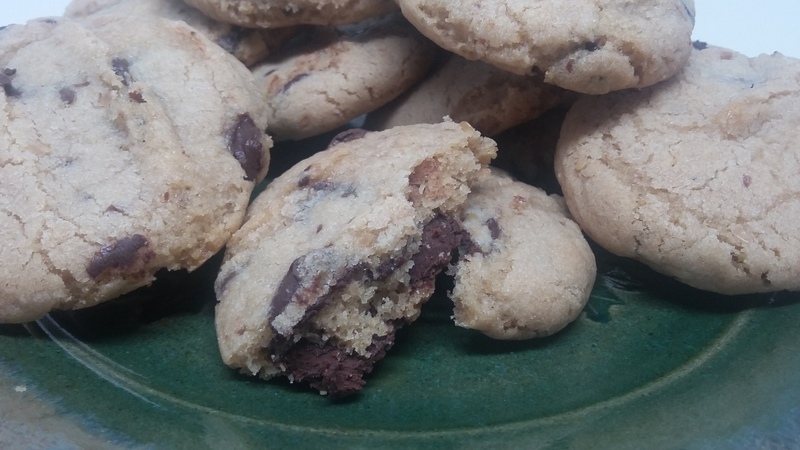 We interrupt this blog post for a Very Important Kitchen Hack: mix coconut oil and chocolate chips together, 2/3 unit coconut oil for every 1 unit chocolate chips, and you’ll have made yourself some chocolate shell! Bam, done! The ice cream itself is made using raw eggs, so Dorie stresses that they have to be very fresh. Personally, I’m not too concerned with salmonella, as I’ve never seen someone get it in my lifetime, but I suspect a lot of people will be turned off this recipe simply because of the raw egg. The eggs are separated and the egg white whipped, while the egg yolk is mixed with sugar and other delicious things. 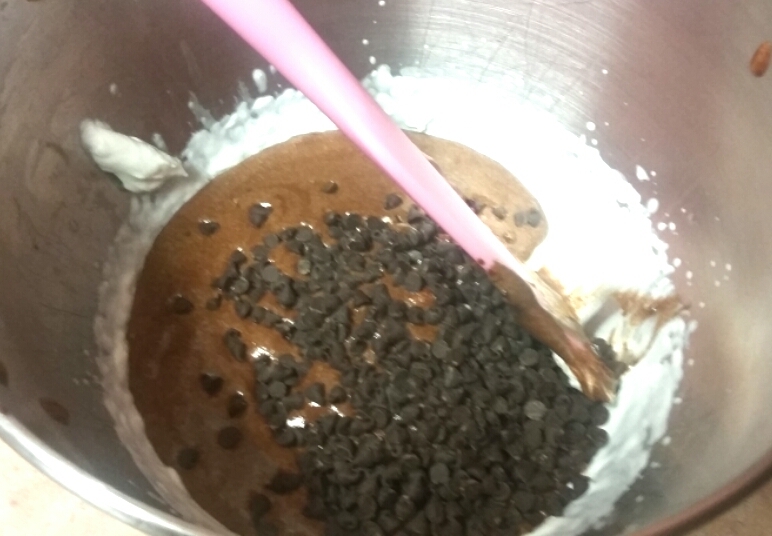 Then they’re all mixed together with some whipped cream, and the chocolate chunks (I used mini chocolate chips) are folded in. Freeze, release them from the molds, and enjoy! 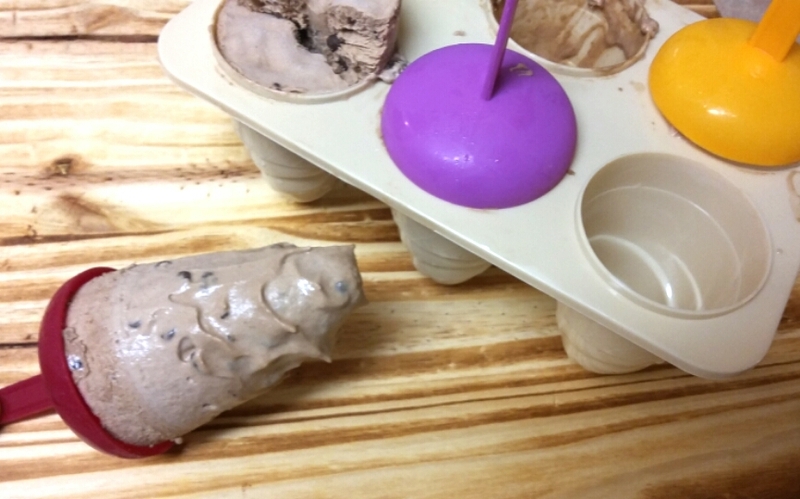 We interrupt this blog post again for a Very Important Kitchen Instruction: to release popsicles from molds, run hot water over the mold or sink the mold into a bowl of hot water, until the popsicles can be pulled out. No wrestling with unwieldly molds, yay! These ice cream pops are definitely a grown-up treat, as the alcohol flavour comes through splendidly (I used rum, and oh yeah, baby! is all I can say). Would I made this again? Probably not, just because they’re a bit of a pain to mix together and I think it’s much easier just to make ice cream using my standard whipping cream, rum, and condensed milk recipe. That said, they did cool me off considerably when I ate them post-work for several evenings! Should I call it dessert or should I call it dinner? Eh, potato, potahto! Next Post: Skor Mini Cupcakes? Bite-sized cupcakes of Skor delight! Probably. Unless something else delicious catches my eye. Linking Up at Southern Plate, Stone Gable, and A Proverbs 31 Wife. This entry was posted in Cook-a-Longs R Us, Desserts Not Otherwise Categorized on August 18, 2016 by Margaret.